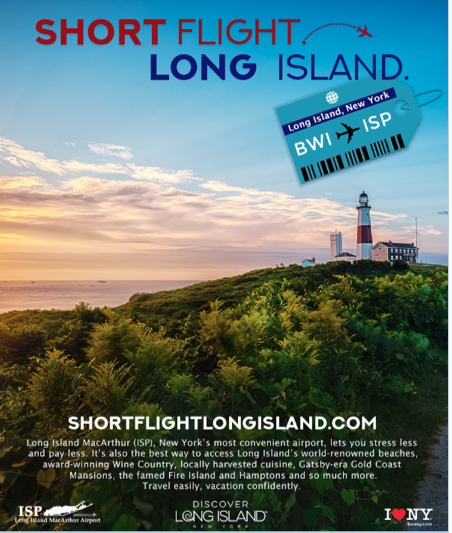 Town and County officials, in partnership with Discover Long Island, today unveiled an industry-leading cooperative marketing campaign between MacArthur Airport and Discover Long Island, at an announcement made at Long Island MacArthur Airport. The new, multi-faceted cooperative marketing initiative, “Short Flight. Long Island.” slogan is designed to build awareness of Long Island as a destination, and increase demand for MacArthur Airport as a go-to hub. The details of the campaign were made available by Angie Carpenter, Islip Town Supervisor; Steve Bellone, Suffolk County Executive; Shelley LaRose-Arken, Airport Commissioner; and Kristen Jarnagin, President/CEO of Discover Long Island, elected officials, business leaders, and local tourism stakeholders. The Baltimore / Washington D.C. market will serve as the initial target region for the campaign based on research, population, and frequency of service. The campaign incorporates experiential, digital and social media assets, with highlights including a BWI Wi-Fi take-over, advertising platforms at highly trafficked Metro stations across the D.C. and Maryland regions, and bike share kiosk promotion in the D.C. market. 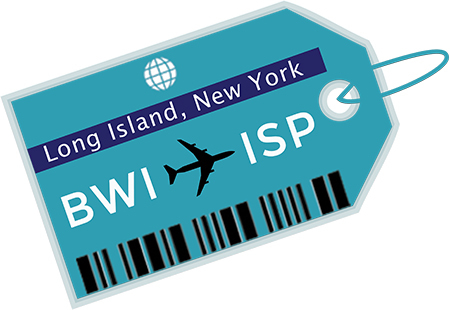 A campaign landing page with the URL, shortflightlongisland.com, was implemented with unique tracking capabilities in order to capture click-rate metrics. In addition, targeted digital and social media components were integrated into the campaign to maximize visibility in the market. “Our main objective through this strategic partnership with Discover Long Island is to raise awareness of Long Island as a destination and increase use of MacArthur Airport as an easy access point for travelers,” explained Airport Commissioner Shelley LaRose-Arken. “The Baltimore / Washington D.C. area is our initial target region due to the frequency of flights between the two major markets. MacArthur Airport is within easy reach to Long Island’s top tourist attractions including our beaches, the Hamptons and beautiful Fire Island. All it takes is a short flight to our convenient airport,” she added. “This is a ground-breaking partnership for tourism and economic development on Long Island,” said Kristen Jarnagin, President & CEO of Discover Long Island. “The promotion of our region’s connectivity to key markets such as Washington D.C. and Maryland are essential for driving tourism and business attraction to our destination. Tourism is a $5.6 billion industry on Long Island, and by leveraging marketing opportunities and developing strategic partnerships, we continue to increase economic benefits to the region as a whole,” she added. “We have so much to offer to visitors, and the additional tourism will benefit the businesses of Long Island,” explained Town of Islip Supervisor Angie Carpenter. “What an excellent, short and easy getaway to our area. We want to share the appeal of our dining, visitor attractions, accommodations, coastline and convenient gateway airport with a wider audience, which will bring more jobs and economic opportunity,” added Supervisor Carpenter. “This new marketing campaign is critically important to both promoting MacArthur Airport across the country as well as increasing awareness of Long Island to travelers in order to boost tourism for our region. I thank Supervisor Carpenter and Discover Long Island for working with Suffolk County to build on our efforts to lure more out-of-state visitors to Long Island, and take advantage of our world-class tourist destinations,” said Suffolk County Executive Steve Bellone. “This marketing campaign complements what we’ve been doing over the past year,” explained LaRose-Arken. In March of 2017, we started the ‘Fly MacArthur’ campaign to raise awareness of the airport locally. Since then, we have seen seat growth of over 50 percent at ISP. In fact, year-over-year, MacArthur Airport is the fastest growing domestic service airport in America. We want to keep that momentum going as we continue to work hard to increase flight options for our community. This is a logical next step for us,” she added. “We are proud of the progress we are making on behalf of the Town of Islip, Suffolk and Nassau counties, and all of Long Island. The airport generates over $600 million each year to the region’s economy and uses no local tax dollars. When it comes to this airport, we are very business-minded, and at the same time, providing an incredible customer experience for the traveling public,” Carpenter added. Key findings from a leading market research provider influenced the campaign, solidifying the need for an impactful perception analysis to generate positive awareness with travelers from the intended regions. For more information on this initiative, please visit www.ShortFlightLongIsIand.com.